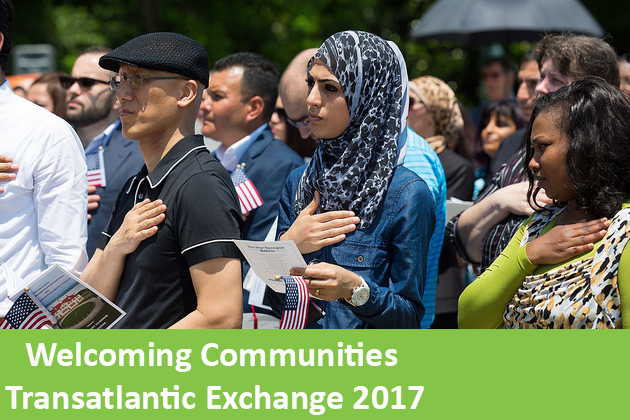 What is the Welcoming Communities Transatlantic Exchange (WCTE)? Participants will learn important new skills around issues such as community engagement, refugee outreach, positive communications, local policy development, evaluation, and many other areas critical for creating a welcoming community where all members can thrive. The program aims to build the capacity of local integration practitioners and, through them, strengthen the welcoming infrastructure of the communities in which they work. The program is administered by Cultural Vistas, Welcoming America, and the Heinrich Böll Foundation North America. April 29 – May 9, 2017: German participants visit the U.S. The program seeks the participation of "teams" of integration practitioners from a common community, who will be able to work together to improve the integration processes at various levels of their community following the exchange. Teams should include representatives from different parts of the local welcoming “infrastructure,” such as city government, refugee resettlement agencies, local schools or universities, immigrant organizations, faith communities, etc. Diverse, gender-balanced teams are strongly encouraged. A total of 4 teams from the U.S. and 5 teams from Germany will be selected to participate in the 2016 program, representing 9 communities total. To strengthen their application, each candidate may, at their own discretion, include a letter of support from their organization as part of the online application. Applications will be reviewed, and acceptance decisions will be made by a selection committee representing Cultural Vistas, Welcoming America, and the Heinrich Böll Foundation North America. Please note that the language of the exchange will be English, and that all participants must be able to communicate in and understand spoken and written English. For general questions on the Welcoming Communities Transatlantic Exchange or the application process, please contact info@culturalvistas.eu. After Danish Jews fled to their neutral neighbours in 1943 and Sweden agreed to offer temporary refuge to some thirty thousand survivors of the Nazi concentration camps, a country deeply averse to foreigners transformed. So can Europe today. An article of the "Berlin Anthology". Europe has always been a continent of refugees und migrations. The debate surrounding how to deal with these challenges has only just begun. An article of our "Berlin Anthology".